I have received my first ever blogging award! I can’t begin to tell you how excited I was when I found out that I had been nominated by fellow blogger Sarah Ball, who blogs over at Jolly Good Cake Club. Thank you Sarah. To receive an award when I have only been blogging for a short while is the best thing ever and its pink, which will make Alice happy. 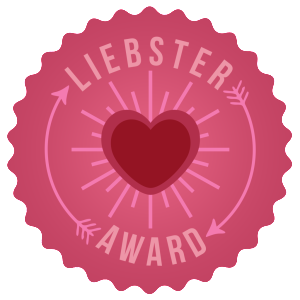 In case you are wondering the Liebster Award is an award given by a blogger to a blogger. Liebster means beloved in German and I am feeling the love. Sarah was given eleven questions to answer for her nomination, she answered them all and then has to give me and the other nominees eleven question to answer. It’s a really great way for bloggers to connect and support each other, which is only a good thing in my book. What motivated you to start blogging? I first thought about starting a blog three years ago, but I wasn’t brave enough to give it ago. The thought never went away and after some encouragement from my husband and the need to do something for me, I took the plunge. I love it and I kick myself for not doing it sooner. What’s your favourite type of cake? Hands down, Lemon drizzle cake. What’s your dream job? I don’t really have a profession or particular job that I dream of doing. What I do dream of doing, is something that I love, something that I am passionate about, something that is for me, whilst supporting and meeting my families needs. What’s the last thing you do before going to bed? Read my book, most of the time I only read about five minutes before I fall asleep. It takes me ages to finish a book these days. But, I love to read and I try really hard to make it a part of life anyway I can. Which social media site helps your blog the most? Twitter is where I get the most traffic to my blog. I love the comments I get on Facebook from people and having a chat. What’s your favourite time of year? Summer, not just because hopefully we will get some sun. But, because all our birthday’s are in the summer and its full of parties and cake! If you wrote a book, what would it be about? I have always felt there was a book inside me, waiting to come out. I often come up with a storyline in my mind and it is always about friendship. What’s the worst thing about blogging? At the moment feeling like the new girl at school, waiting to see if you are going to be accepted into the club. If you have another job apart from ‘blogger’ what do you do? I don’t at the moment, I am home with my two girls. The ballet or a rock concert? Neither really, but if I was pushed, it would be…no, even if I was pushed I can’t! Now, for who I am going to nominate…This is for newish bloggers and there are a few lovely bloggers that I would like to nominate, who I think are fab! Where would you go on holiday, if money was no object? Which social media site is your favourite? Where’s your favourite place to shop and why? So, all that is left for me to tell you is to thank the blog that nominated you (that’s me) in your blog post. Have fun and if you take part let me know so I can read you post! It’s always fun to find out a bit more about bloggers and what inspired them to start. I can definitely agree about falling asleep over my book too, the last thing I do every night too. Its so annoying isn’t it, I really want to finish my book!! Thanks so much for the nomination! I love reading these posts – it’s always lovely to get a bit of an insight into some of my favourite bloggers (and you’ve nominated a couple of my other favourite blogs too!) I can relate to your ‘new girl’ feelings too – although the parent blogging community is really welcoming, there’s always that sense when you’re a newbie, isn’t there? Wow that is amazing, you go girl! Congratulations, you must be over moon!